This month’s Bostik Blogger theme is Christmas. 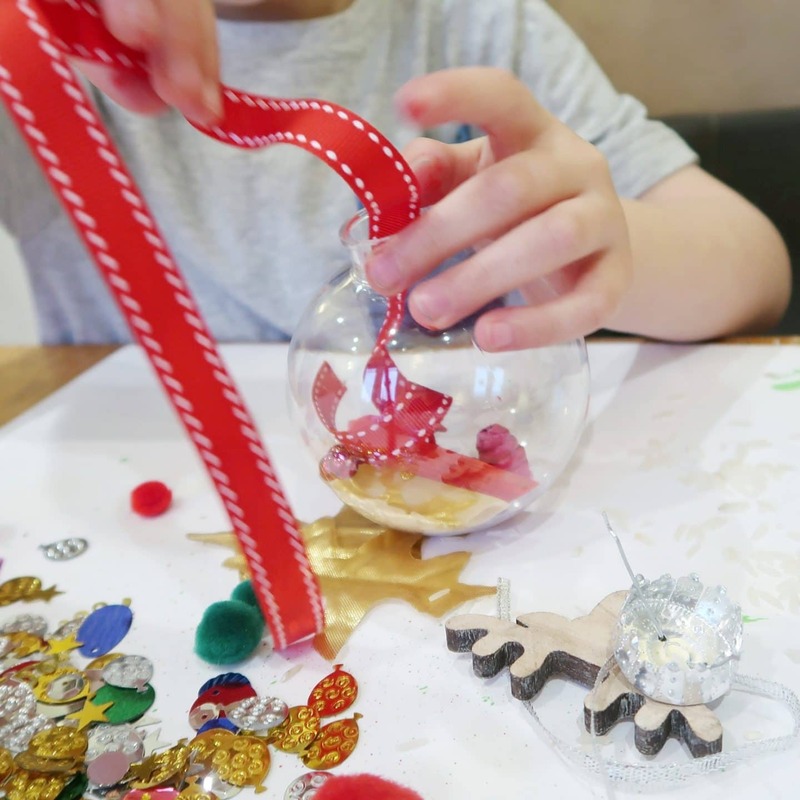 Since Biggest is a great sensory seeker and loves Christmas decorations of all types, I decided to create a craft that would make Christmas even more of a sensory experience for him – and develop his motor skills. 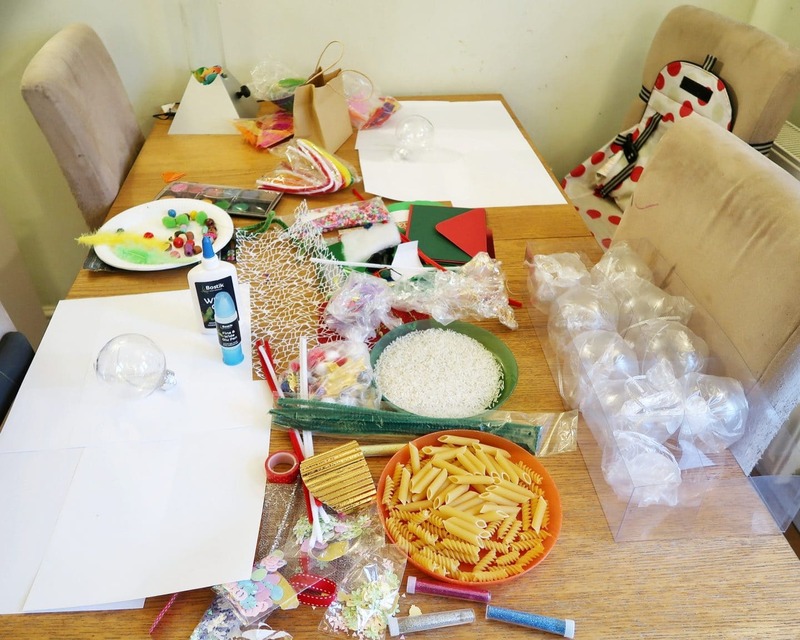 We used every day items and hollow, clear plastic baubles, in order to create decorations that can be used on the tree, and which provide a great sensory experience, both during and after the crafting. Gathered objects – leaves, acorns etc. This is a fairly easy one to explain because anything goes! 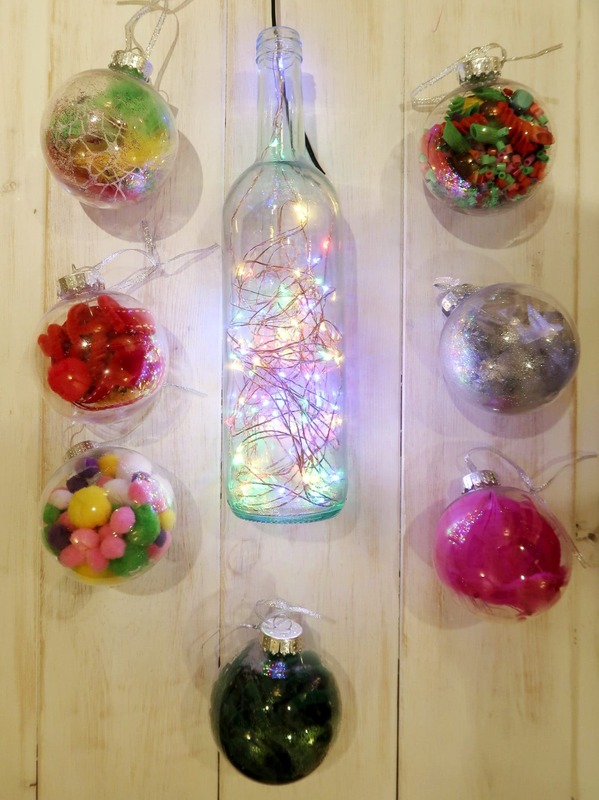 If an object is safe, will be preserved enough to last the Christmas season, and can fit in the bauble, you can use it to decorate them. 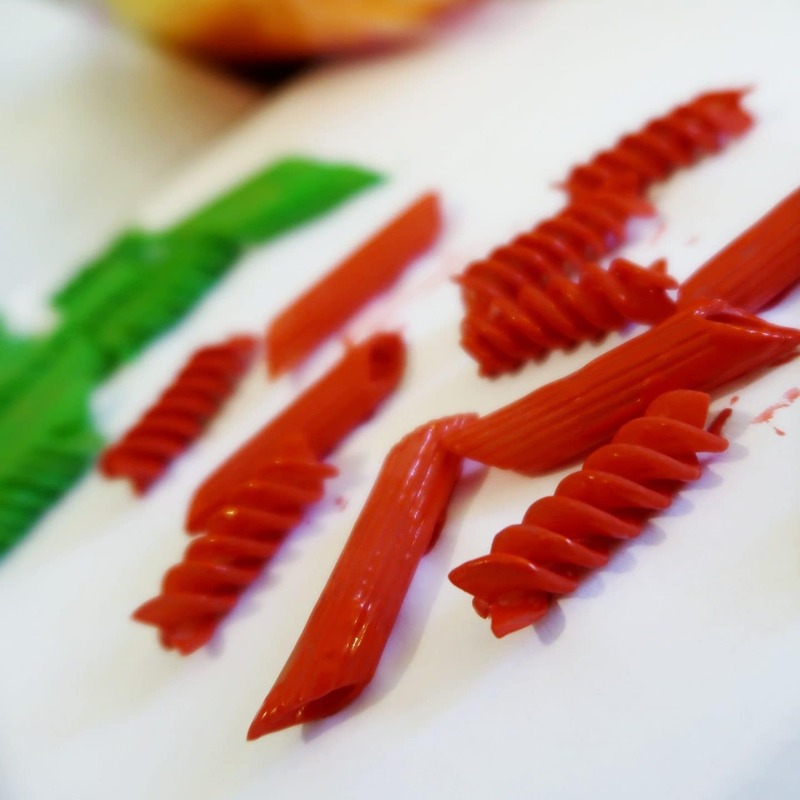 As biggest loves sensory activities, I made sure we had a range of textures and colours. 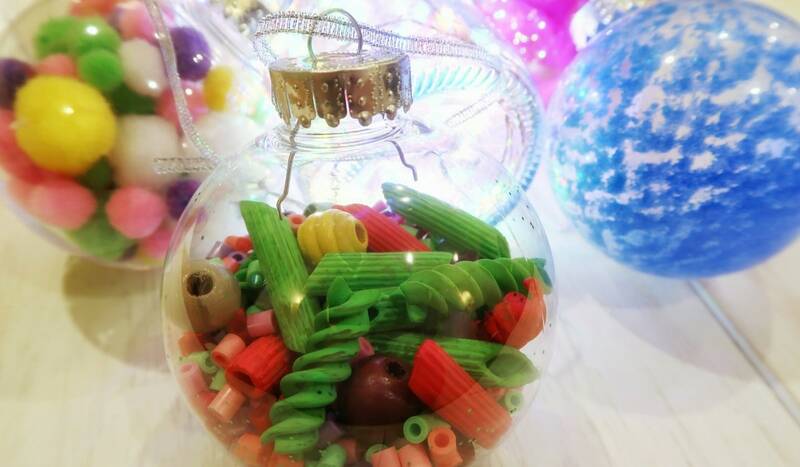 I also included things like uncooked rice and pasta, as they can be added to turn the baubles into shakers that make different sounds. 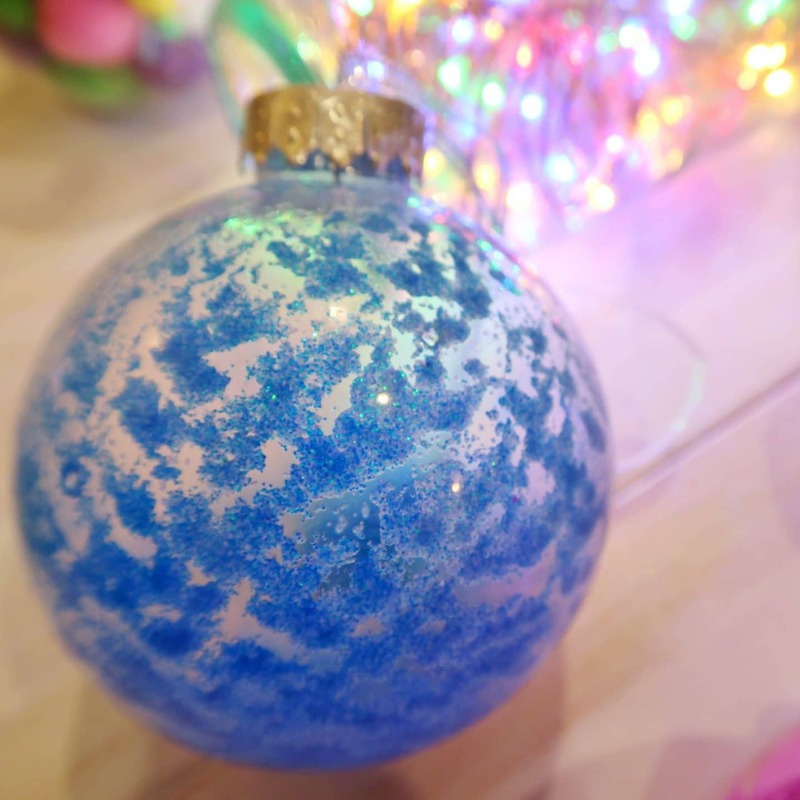 You can add a little glue to the inside of the bauble, to stick materials like glitter in place if you wish. Once you have collected or bought a range of items, you can let the children have free reign. 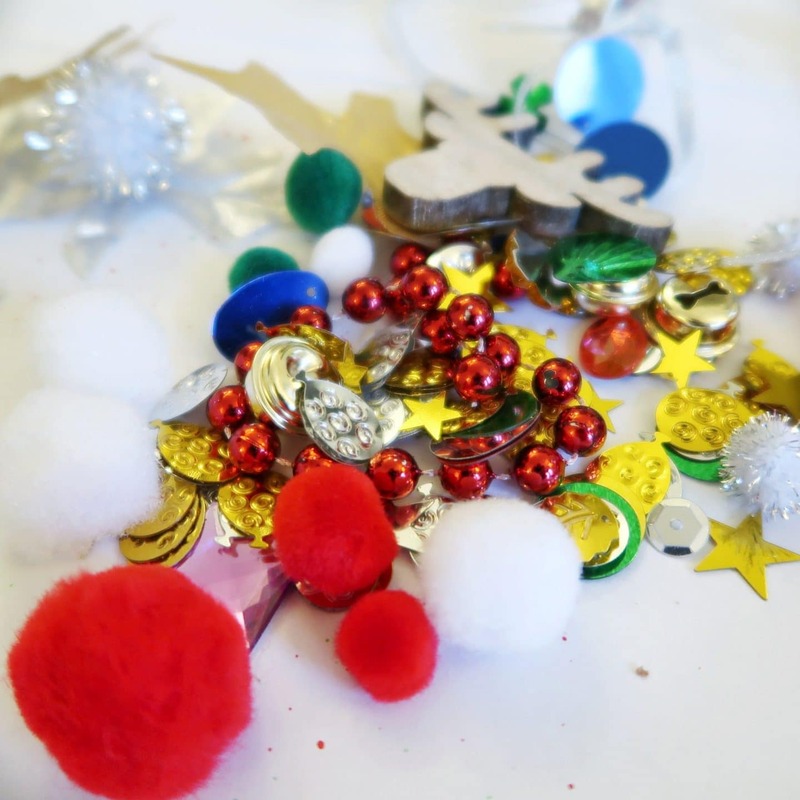 The baubles we used were plastic and shatter-proof, and so they could drop or bash them with no issues. I let mine choose what they wanted to put inside. 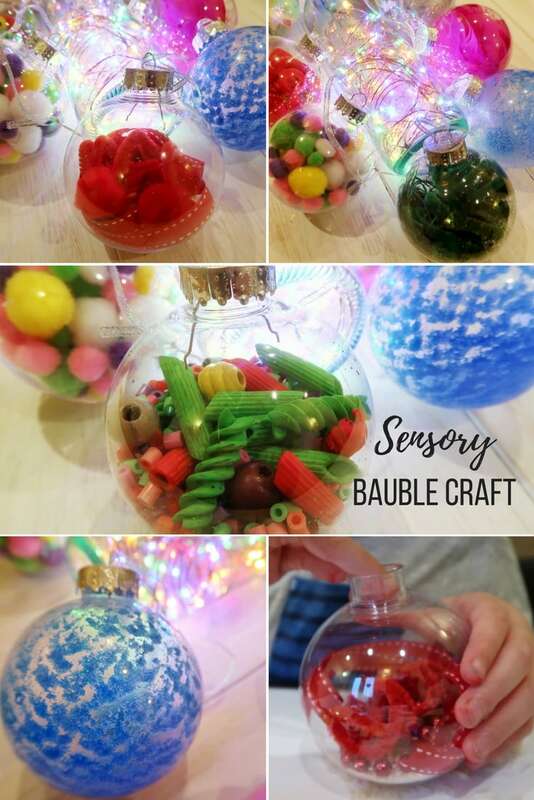 The great thing about this sensory bauble craft is that the finished baubles generally look great – whatever the kids decided to put in them! Even if you have a tasteful tree with a colour scheme, you can still use the children’s creations. Adding glitter, feathers, or even pipe-cleaners in a particular colour scheme can give a really pleasing effect. 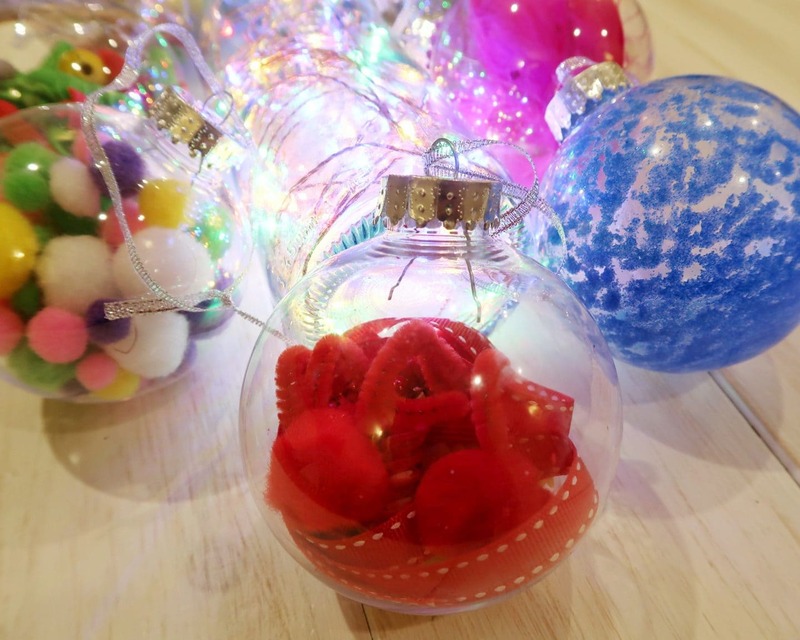 A bauble filled with a single item, like pom poms or pasta shapes can also look really effective. By the end of our afternoon, both children had made several baubles, almost entirely by themselves, and they all looked great! 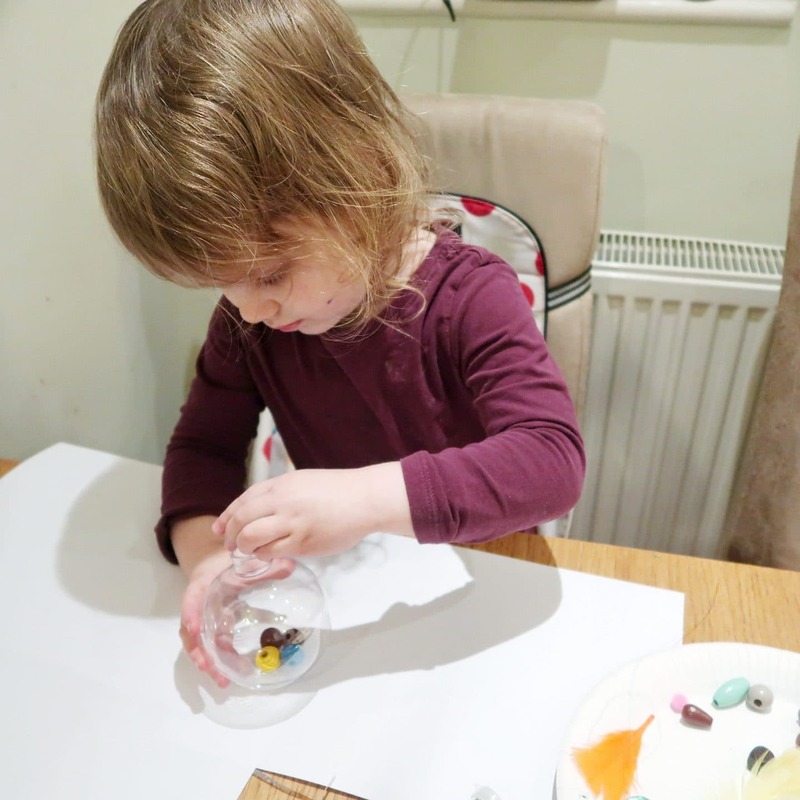 As the baubles have fairly narrow necks, and many of the items were fiddly or needed to be manipulated, this meant the task was also a good activity to develop fine motor skills. You can make pipe-cleaners into spirals that need to be threaded into the bauble. Likewise, items like thread and ribbon can be fed carefully. Smaller items, like beads, can help with the grip and pincer movements. This was an activity that the children really enjoyed and I was so pleased with the results that I think some will definitely make it onto the tree! 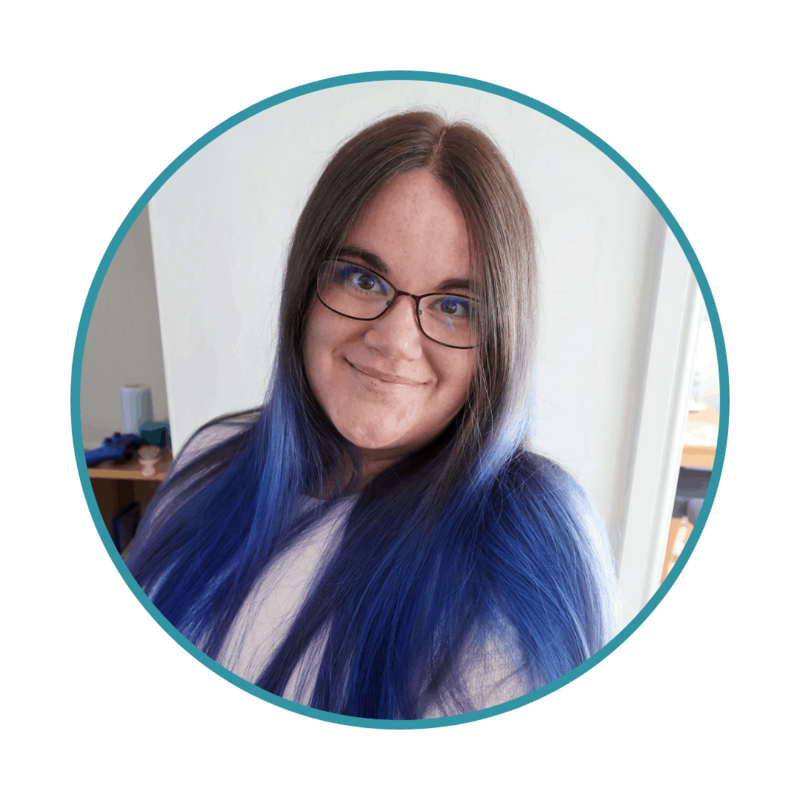 Please note, Bostik send us some crafting items each month in order to complete the #BostikBlogger monthly Crafting challenge. Some links may be afflilate. This means if you click through and buy something, we may earn a small commission. For more crafts to do with kids, check out our crafting section. They really do look fabulous. Some of my favourite baubles on my tree have been made by my children. 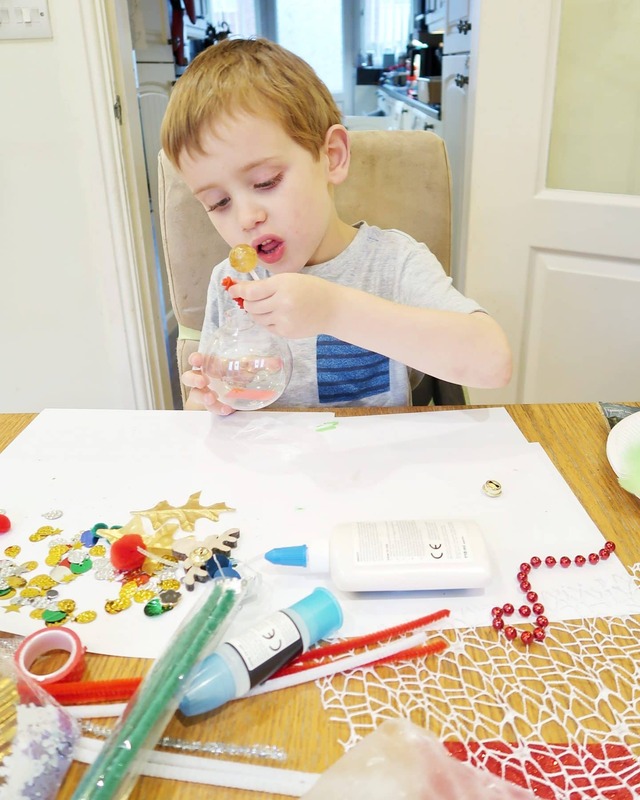 I love the idea of turning the decorating into a sensory craft.